RetroShare is a decentralized and private communication platform that lets you securely share files with your friends and family in real-time, as well as chat with them. The program puts a special emphasis on privacy and security by issuing encrypted connections among authenticated friends. The messaging client offers a wide array of chat features such as private chat with your friends, public and private chat lobbies, forums, as well as VoIP services. It also provides asymmetric encryption capabilities via PGP. Available as an open-source chat application, the instant messenger includes channels that let you share or broadcast a set of files to your friends. You can create a new channel and add various files so your friends can download these files automatically. However, you can disable automatic downloads if you want to download some desired files only. Download RetroShare now to conveniently exchange files with your near or dear ones. The instant messaging and VoIP service helps you share larger files of 1GB or more. Your privacy is protected using anonymous tunnels. You can use links, which allow file downloads directly to RetroShare. The utility allows you to create a collection of your files and make shared folders that can be browsed by your friends. You can not only send text and images to your friends, but it also enables you to start a secure voice or video call using VoIP plugin. What’s more, you can perform searches, view simultaneous downloads in queue list, pause/resume or cancel downloads, and set priorities. The latest version of RetroShare boasts a clean-look and well organized user interface. The News Feed displays detailed notifications about all your messages. The other tabs provides you a quick access to several functions, including joining chat lobbies, reading feeds, sharing files, creating channels and checking links. > Can set up popup notifications for several events such as new message, complete download etc. The messaging software for PC comes with power-packed features that allow secure communication and file sharing over the Internet. 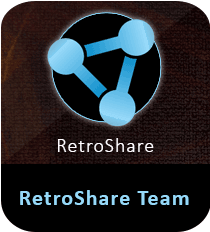 Get RetroShare for free and take your P2P & file sharing experience to the next level.